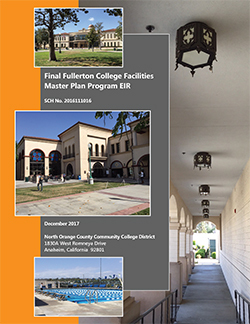 Over the next 20 years, Fullerton College will roll out comprehensive construction and renovation projects thanks to Measure J, a voter-approved bond from the November 2014 election. The initial priority projects include a parking structure; a Lab School (childcare center) and a horticulture building. Additional plans include among others, a Welcome Center, which will house student/veteran services, a classroom building, a performing arts center and final renovations to the classroom buildings that were not included in the previous bond, Measure X. Formally called the Fullerton/Cypress Colleges Repair and Student/Veteran Job Training Measure, Measure J generates $574 million for facility improvements, upgrades, and repairs at North Orange County Community College District schools which also include Cypress College and the School of Continuing Education. Visit the NOCCCD Measure J website for district-wide information. Click here to view information on the Sherbeck Field project. The Draft Program Environmental Impact Report is available for a 45-day public comment period from August 18, 2017 through October 01, 2017. A copy of the Draft Program EIR is also available for public review at the Fullerton Public Library, 353 W. Commonwealth Ave., Fullerton, California 92832, and at the Administrative Offices, North Orange County Community College District, Anaheim campus, located at 1830 West Romneya Drive, Building A, Anaheim, California 92801-1819. Comments on the Draft Program EIR may be made in writing, with a contact name and return address or email, and should be sent to Richard Williams at North Orange County Community College District, 1830 West Romneya Drive, Building A, Anaheim, California 92801-1819. Due to the time limits mandated by state law, your response must be sent at the earliest possible date but no later than 45 days after receipt of this notice. Following the passage of Measure J, Fullerton College is now embarking on a comprehensive planning process that will determine the location and sequencing of building and renovation projects on its campus. As an initial step in this planning, the college is seeking input from the campus community and the community at-large at a series of open forums. The first forums were held in the spring of 2015. In October, architects will present findings and recommendations from the previous open forums. Guests will have an opportunity to ask questions and share their input about proposed building locations and the sequencing of projects.